Politics makes strange bedfellows - and nowhere more so than Oaxaca, where the oft-conflictive southern state holds local and gubernatorial elections July 4 that will choose a successor to polemic Gov. Ulises Ruiz. To refresh memories, Ruiz heads an old-school state chapter of the Institutional Revolutionary Party (PRI), clashes frequently with Section 22 of the SNTE teachers union and various left-wing movements and presided over a 2006 uprising by the teachers and their allies that descended into lawlessness and destroyed the state's tourism-dependent economy. The National Action Party (PAN) and Democratic Revolution Party (PRD) so dislike Ruiz - who last fall was found responsible for human rights violations in the uprising by a Supreme Court investigation - that the two political foes appear willing to join forces in an attempt to oust the PRI, which is said to be largely under Ruiz's control. Both PAN president César Nava said PRD president Jesús Ortega have already spoken favourably of a possible alliance - even if the logistics of carrying it out would be difficult. It would require the PAN to back a candidate - most likely former Oaxaca city mayor and Convergence party Sen. Gabino Cué, who was backed by a similar coalition in 2004 - that is considered close to Andrés Manuel López Obrador, an anti-establishment figure the PAN party branded, "A danger for Mexico," during the 2006 presidential election. For the PRD, forging an alliance with the PAN requires still-scorned members to partner with a party that López Obrador derides (along with the PRI) as the "mafia" and is run by close allies of President Felipe Calderón - a man they accuse of stealing the 2006 election and refuse to recognize as legitimately elected. López Obrador has rebuked the prospect that any of the country's left-wing parties - PRD, Convergence and the Labour Party (PT) - might even consider forging alliances with either the PAN or PRI. The Oaxaca state chapters of the PAN, PRD, PT and Convergence already all have signed onto the alliance. Any alliance must be registered by Feb. 10. The Mexican political landscape has changed over the past three years, however, making a possible alliance and cooperation between bitter enemies a possibility. The PAN has lost ground in Congress, while the PRD has been beset with internal divisions. The PRI juggernaut appears set to roll once again in 2010, too. The PRI enters 2010 on a roll, having captured a plurality in the lower house of Congress last year and having dominated state and local races in the years since the party's disastrous third-place showing in the 2006 presidential and congressional elections. For some political observers, the willingness of disparate opposition parties to now forge electoral alliances reflects the revival of a once-popular strategy for taking down the PRI during the 1990s, when its grip on power began to weaken. "It's the old opposition strategy against the PRI," said Federico Estévez, political science professor at ITAM. "It makes the PRI fight for every last vote." But Oaxaca could be just one of many unlikely alliances in 2010, when 12 states - including such PRI bastions as Oaxaca, Puebla, Veracruz, Hidalgo and Durango - elect new governors. PAN officials have already said that they would consider electoral alliances in states with polemic PRI governors - such as Puebla, where Gov. Mario Marín gained infamy in 2006 for attempting to railroad journalist Lydia Cacho - and strong PRI machines that produced clean sweeps in for the party in the 2009 midterm election. Ortega from the PRD said his party would consider alliances in places with "absolutely authoritarian governors." Oaxaca tops that list for many political observers and non-PRI politicians. The state is among the poorest in Mexico and governance among the least transparent. Violence long has been a calling card of Oaxaca politics - and critics of the PRI such as Section 22 and the Oaxaca People's Assembly (APPO) have been accused using tactics such as intimidation, vandalism and extortion, too. Current PRI Deputy Elpidio Concha is accused of belonging to a mob that beat a protesting teacher to death five years ago. (He enjoys immunity from prosecution as a Chamber of Deputies member. 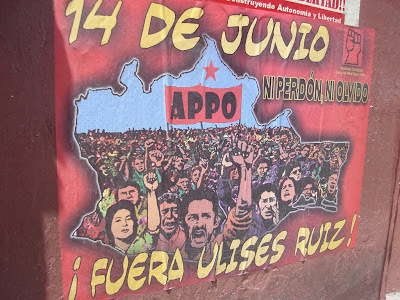 Diego Petersen Farah, former editor of the Guadalajara newspaper, Público, opined during the 2006 uprising, "Ulises Ruiz is a troglodyte and the Oaxaca PRI is more a criminal organization than a political party." López Obrador spent the latter part of 2009 touring the more than 400 Oaxaca municipalities that use non-partisan forms of local governance that are based on traditional "usos y costumbres." Cue travelled with López Obrador - who carried Oaxaca during the 2006 presidential election - during the tour, which featured outbursts blasting both the PAN and PRI. The former presidential candidate has been critical of Ruiz and the Oaxaca PRI for years. The criticism increased after the April 2009 assassination of an Oaxaca activist for his "legitimate government," Beatriz López Leyva, that was blamed by her family on a PRI mayor. Opposition politicians called for Ruiz's head, but he refused to back down. The PRI also refused to abandon Ruiz. Political circumstances ultimately saved him - along with political tactics for survival by the PAN and Calderón, who barely won the 2006 election and risked having the PRD block his taking the oath of office. With the PRD attempting to prevent Calderón from taking office, the president began working with the PRI. As Grupo Reforma columnist Sergio Sarmiento told me in Nov. 2006: "Either (PAN) makes agreements with the PRI or they forget about ruling the country for the next six years." The cost of making agreements with the PRI appears to have been high. Former PAN deputy Gerardo Priego told me numerous times in 2008 that his party erred by making so many legislative and political deals with the PRI - at the price of sparing governors such as Ruiz and Marin - and that voters would punish the PAN because they would "see no difference" and opt for the more experienced party. Now the PAN wants the PRI out of the Oaxaca governor's office - and could be willing to make agreements with a man they consider "a danger for Mexico" to do so. Estevéz gives the coalition a chance of success since the PAN has reasonably a good organization in some parts of the state and former interior secretary and former Oaxaca governor Diódoro Carrasco defected to the PAN in recent years. Cué performed strongly in 2004 and Ruiz has been polemic since taking office. The terms of agreement might derail any coalition, though. "PAN is usually unwilling to go into alliances if it's the junior partner," Estévez said. And then there's the prospect of trying to unseat a party that has always governed Oaxaca and operates a legendary political machine that produced a clean-sweep in last summer's midterm elections and reputedly is operating on all cylinders - especially in the "usos y costumbres" municipalities. "Oaxaca is old-time Mexico, in terms of politics," Estévez said.